German forces attempt to cross the Mons-Condé Canal by throwing pontoons across the water. Drawing by Fortunino Matania. In Britain’s first encounter of the war, the British Expeditionary Force engaged German forces at Mons in Belgium. At the start of the war, Britain had a relatively small standing army of about 100,000 men ready to fight. This initial group comprised the first wave of British troops on the ground, called the British Expeditionary Force (BEF). On 12 August this force landed at Boulogne, on the French coast, and reached the front at Mons ten days later. Here they had their first engagement, supporting the much larger French army, who were combatting the German advance on Paris. In a battle lasting the day and night of 23 August, the BEF attempted to stop German forces from crossing the Mons-Condé canal. In principle, the BEF was comprised of the most experienced soldiers the British Army possessed, including those who had seen battle in colonial conflicts such as the Boer War. At Mons, they demonstrated effective musketry and artillery resistance. Many, however, were drawn from the army reserves, and were less experienced than this implies. Historical accounts therefore differ over the strength of resistance put up by the BEF, and the cause of their eventual retreat. The BEF were outnumbered and suffered greater losses than the opposing German divisions. Nearby French forces withdrew on 24 August, and the BEF, severely battered, did likewise. After a wearying battle and hasty retreat, the BEF was in exceptionally poor condition when it arrived at the Marne. As part of a combined French and British attempt to hold off the German advance, this episode was unsuccessful. Reports back in Britain were subdued, and subject to censorship under the Defence of the Realm Act. The British presence in France was not announced until 17 August, and their location remained a secret until after the engagement at Mons. 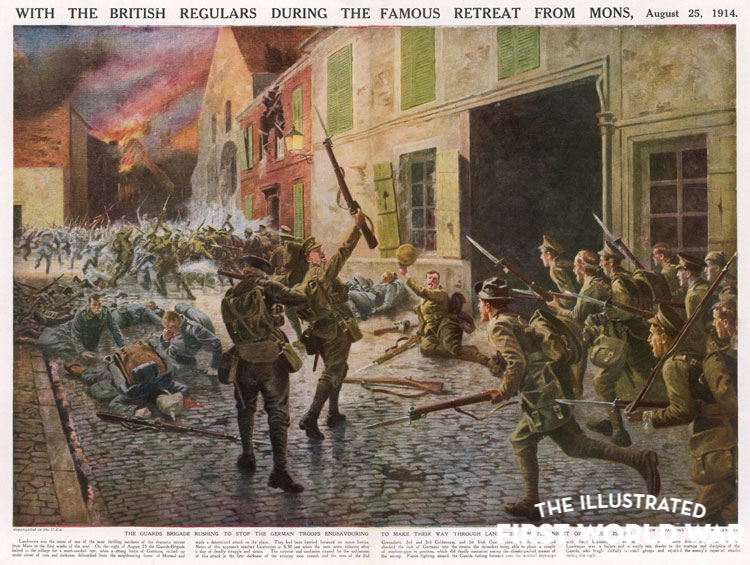 Accounts of the battle in The Illustrated London News were positive, asserting the superior nerve and skill of the British soldiers with titles such as ”When Our Men were Proving Personal Ascendancy over the Germans”. The retreat from Mons saw further skirmishes, and German losses inflicted at Landrecies, during the retreat, were reported triumphantly. The Battle of Mons and the subsequent retreat soon became one of the landmark memories of the war – a heroic tale of courage and resilience under pressure. 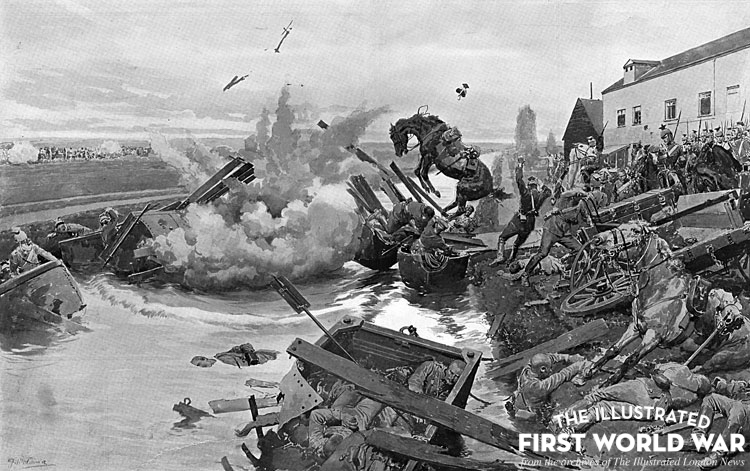 By 1916 the first autobiographical accounts of the episode appeared, and by 1917 The Illustrated London News was describing it as “a story that seems already as old as it is glorious”. The legendary status of Mons also created an interesting byproduct, in the myth of the Angel of Mons. In 1914 Arthur Machen published a short story ‘The Bowmen’, which imagined the long-dead bowmen of Agincourt coming to the aid of the beleaguered soldiers of Mons. Accounts of a supernatural appearance – either an angel, or heavenly bowmen – soon spread as a popular myth of the war. The Illustrated London News took advantage of the drama of the myth, publishing an illustration of the ghostly bowmen at Mons in 1915.